The theme and text for each year's observance of the Week of Prayer for Christian Unity are chosen and prepared by representatives of the Pontifical Council for Promoting Christian Unity and representatives of the World Council of Churches. The international texts are developed, adapted and published for use in the USA by the Graymoor Ecumenical & Interreligious Institute. The GEII invites the collaboration of ecumenical agencies and ecumenists to assist in this project. WPCU resources are printed for ordering by RKG Fund Raising Services Cold Spring, New York. For further information, contact the Graymoor Ecumenical & Interreligious Institute at the address below. Resources available in print are in color. All resources are undated to facilitate their continuing usefulness. They are described below and are ready for shipment in mid-October. Two-color, four page (5½x 8½) guide with biblical passages, meditation and prayer for personal and group uses. Shipped folded. English or Spanish $6.00 per hundred. Full-color, four-page (5½x 8½) worship service with the year's theme art on front. Shipped flat. English or Spanish $7.00 per hundred. 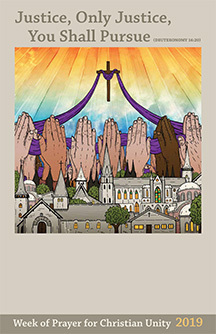 Full-color card (2¾ x 4½) with the year's theme art on front and a prayer for unity on back. English or Spanish. $9.00 per hundred. Full-color (11 x 17) theme art and scripture passage. English or Spanish. Full-color, four-page (5½ x 8½) cover with the year's theme art. Undated. Inside blank for local imprinting. Shipped flat. English or Spanish $.6.50 per hundred. Resources on the website may be printed. Resources on the website include a brief history of the Week of Prayer for Christian Unity, an ecumenical celebration of the word of God, an exegetical reflection on the scriptural theme, a daily scripture & prayer guide, homily notes, music suggestions, sample pulpit and bulletin announcements and press release, suggestions for promoting and observing the WPCU (traditionally January 18-25), Ecumenical Sunday (within the WPCU) and the annual Martin Luther King, Jr. National Holiday (observed in January). Monthly (except August) publication of the Graymoor Ecumenical & Interreligious Institute containing ecumenical news, documentation and thought. $30.00 per year USA; $40.00 elsewhere. Please Note: Some items may not be ready for shipment until mid-October. Please order early as supplies have run out in recent years.